Topics range from the neurotic need for affection, to guilt feelings and the quest for power, prestige and possession. First Published in 1999. Routledge is an imprint of Taylor & Francis, an informa company. Introduction, I. Cultural and Psychological Implications of Neuroses, II. Reasons for Speaking of a "Neurotic Personality of Our Time", III. Anxiety, IV. Anxiety and Hostility V. The Basic Structure of Neuroses, VI. The Neurotic Need for Affection, VII. Further Characteristics of the Neurotic Need for Affection, VIII. Ways of Getting Affection and Sensitivity to Rejection, IX. The Role of Sexuality in the Neurotic Need for Affection, X. The Quest for Power, Prestige and Possession, XI. Neurotic Competitiveness. 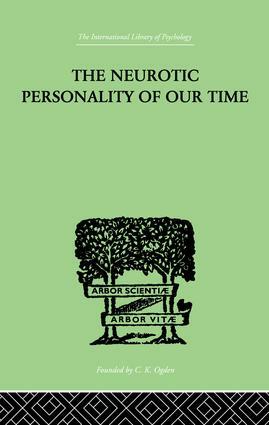 Karen Horney (1885-1952) was one of the most influential psychoanalysts of the twentieth century. Her books include Neurosis and Human Growth, The Neurotic Personality of Our Time, New Ways in Psychoanalysis, Our Inner Conflicts, Self-Analysis, Feminine Psychology, Final Lectures, and, as editor, Are You Considering Psychoanalysis?